The Cromwell is arguably the best known, most produced and most successful of the cruisers lineage started in 1936, at least until the arrival of the Comet in late 1944. Its genesis goes back to 1941, and the choice of the gun and engine proved to be crucial matters. War priorities spawned three tanks sharing the same design but different engines. The A24 Cavalier used the Nuffield engine and most components from the Crusader, the A27L Centaur was a transitional model still fitted with the Nuffield Liberty L12 engine but Cromwell components (only to be replaced by Rolls Royce engine at the end of the production). The Cromwell, propelled with the Rolls-Royce Meteor (painfully adapted from the Merlin, the Spitfire’s engine), was a league forward both in mobility and reliability. It was the only one of the three to see active service in Europe, the two other being used for training and as special purpose tanks, especially with the Royal Artillery. All three tanks originated in the A24 Cromwell (a name that was approved early on, named after the Parliamentarian and Puritan victor of the Mid-1600s English Civil War, Oliver Cromwell) first drawn from a General Staff specifications to replace the Crusader. The latter was seen as a good tank in 1940 but became rapidly obsolete both in terms of protection and firepower. Designs were submitted in early 1941. In early 1942, Rolls-Royce was chosen to develop the engine, as the Nuffield V12 showed its age, lack of power and reliability. However, development delays meant a first model, the A24 Cavalier, then known as “Cromwell I”, was produced. It was built by Nuffield and rushed out mostly with Crusader components, although the hull, turret design, drivetrain and general configuration were new. The Cavalier was disappointing because the superior weight of the armor was combined with the same engine as before. In the same timeframe, Leyland and Birmingham Railway Carriage & Wagon (BRC&W) produced an improved version of the Liberty engine, with the intervention of the General Staff. The General Staff A27 included the Rolls Royce engine and, more importantly, the QF 6 pdr gun (57 mm/2.24 in), which was the best AT gun of the Allies at that time. It was expected to enter service in mid-1942, but delays forced some interim solutions. Firstly, the Crusader was rearmed with this gun (at the expense of one crewman) and, secondly, the Cromwell Mark II built at Leyland Factory with the Nuffield Liberty came out as a stopgap measure. It had better armor, better gun, but most of the mechanical parts of the Crusader and a slightly tweaked engine, but still insufficient in power. The A27L, or Cromwell II (for “Leyland”), is almost considered a clone of the A27M, with everything in common but the engine. The cooling system, for example, was way better than on the Cavalier. 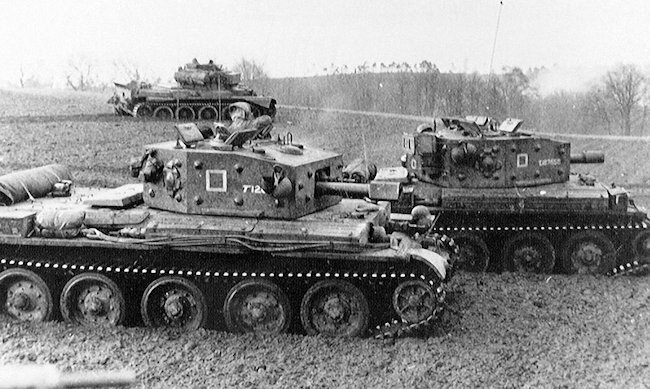 To avoid confusion, the General Staff decided to rename the A24 (Cromwell I) “Cavalier”, and the A27L (Cromwell II) “Centaur”, while the Cromwell III became the A27M Cromwell. The Merlin engine is a legend. Not only because it propelled the Spitfire, the emblematic fighter that saved Great Britain in the summer of 1940 and soldiered on until the 1950s (more than 20,000 were produced and declined in more than twenty-four variants), but also because of its inherent qualities. This new generation of compact and lightweight aircraft engines was quickly found suitable for the new tanks urgently needed by the Royal Armored Corps in 1941. Indeed, Rolls-Royce was famous for the legendary quietness of its engines, so carefully hand-built that practically no vibrations were felt, hence the name of its luxury sedans and coupés (Shadow, Ghost, Cloud). These engines were also credited for a very high degree of reliability that contributed to the reputation of the company, which also produced naval engines. The Schneider Cup, the most famous hydroplane race in the 1930s, was a sandbox where aircraft designers and engineers tried out engines and streamlined, aerodynamic fuselages to house them. Macchi and Supermarine were among the best, rivals that would ultimately pass all this experience onto their fighters. The Rolls-Royce Merlin itself was legendary for its raw horsepower that far surpassed other engines in terms of power-to-weight ratio. The Meteor was the version intended to be used on tanks. The RR Meteor was an V12 water-cooled gasoline engine that was heavily adapted by Chief Engineer W.A. Robotham at the development division in Belper, starting with the Merlin III as a base. Robotham, despite his young age, was made Chief Engineer of Tank Design and joined the Tank board. He also designed the Cruiser VIII (A30) Challenger in 1943, the first tailored design to use the QF 17-pdr (3 in/76.2 mm) gun. In order to be adapted, the Merlin III had to loose its supercharger, reduction gear and other equipment removed from its camshaft, to ensure simpler construction. It was provided with cast pistons, and de-rated to around 600 bhp (447 kW), while running on much lower-octane gasoline instead of usual aviation fuel, for more safety and easier fuel supply. The most expensive light-alloy components were replaced with steel components (starting with the Meteor X). By all standards, it seemed as a downgraded version of the Merlin. In 1943, due to part shortages, dismantled surplus old Merlin blocks were used for Meteor engines. Although it occupied as much space and had the same 1,650 in³ (27 litre) displacement as the earlier Liberty, the Meteor was way more reliable and doubled the power available. Leyland initially got an order for 1,200 Meteor engines, but persisted on their own design and expressed serious doubts about being able to provide the cooling system. Eventually, Meadows was contracted, but by then the manufacturer also declined the order, due to over-capacity. Later the Rover Company, which worked with Rolls Royce, took over the bulk of the production, as did Morris (Coventry). For this reason, it is also sometimes called the Rover Meteor. Originally, the order of 1,000 was given to Rolls-Royce, that asked the government for an open credit of £1 million. But development was slow and Ernest Hives, who took over the project, obtained a trade from Spencer Wilks of Rover, exchanging the W.2B/23 production facility at Barnoldswick for the Rolls-Royce tank engine factory in Nottingham. Final production was officially started on 1st April 1943, although the first trials began in September 1941 at Aldershot, with a roughly modified Merlin in a Crusader (which topped 50 mph/80 km/h on its first test run!). These manufacturing delays explained why active units on the front had to content themselves with Shermans and obsolete Crusaders until early 1944. The hull frame consisted of riveted beams, but later production versions resorted to welding. The armor plates were bolted to the frame, particularly on the turret, which left large characteristic bosses on the outside. The chassis stood on five large roadwheels, with front idlers for tension and rear drive sprockets. The suspension was of the Christie type, with long helical springs angled back to keep the hull down and low. Four out of the five road wheels (rubber-clad) had shock absorbers. There were no track return rollers. The hull sides were two spaced plates with the suspension units between them, the outer plate being cut out to allow movement of the roadwheel axles. Side skirts were provided to protect the upper sides, but they were generally omitted and only the fore and aft mudguards were left in practice. The front armor comprised a three part beak with 50 mm (1.97 in) plates and a flat front armor plate, 76 mm (3 in) thick. From it emerged the driver’s visor, a thick glass block protected by an opening “gate” (right-hand side), and a ball mount for the hull Besa machine-gun on the left-hand side. The driver had a one-piece hatch opening to the right and two built-in day periscopes. He was separated from the hull gunner by a bulkhead. The latter had access to ammunition racks and had his own No.35 telescope and a one-piece hatch. The ball mount gave 45° of traverse and 25° of elevation, connected through a linkage to a handle for firing. A bulkhead with access doors separated the front compartment from the central fighting compartment. On later models, protection was increased, with 3.1 in (79 mm) welded plates (Mark IVw/Vw), then to 4 in (102 mm) on the Mark VII. The boxy turret sat directly above the central fighting compartment, isolated both from the front and engine compartments. The turret was of hexagonal shape, with a 76 mm (3 in) thick front and 50 mm (1.97 in) flat sides and an internal mantlet. The main gun and coaxial Besa protruded from the front plate opening, mated on the same axis. This opening was around 60 cm (2 ft) large and 40 cm (1 ft 3 in) high, with rounded corners. All six plates were made of cast hardened steel. There was a porthole for spent rounds on the rear faces, that could also be used as a pistol port. The gunner operated both the main gun and the 7.92 mm (0.31 in) Besa machine gun and had his own periscope and main visor. The main gun was, at first, the 6-pounder QF (57 mm/2.24 in), modified to fit inside the turret and fitted with a muzzle brake. This gun was only present on the Mark I and all other Marks had better guns. 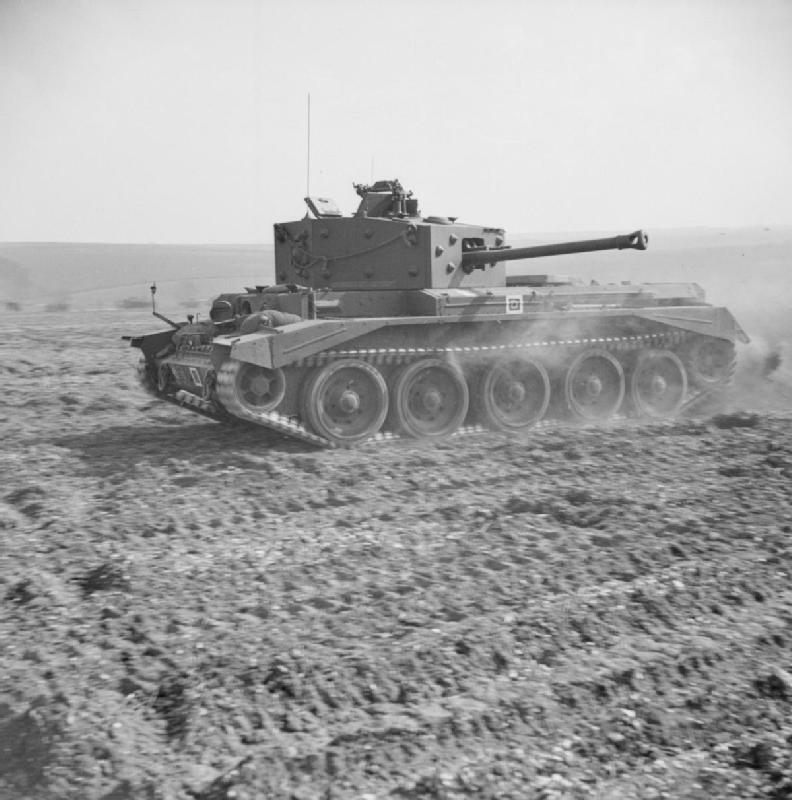 Starting with the Mark II, the Cromwell swapped the QF 6-pdr for the ROQF 75 mm (2.95 in) gun, which was an adaptation of the 6-pounder design to fire the ammunition of the US M3 75 mm (2.95 in) gun, including a better HE round for use in infantry support. This adaptation also meant that the 75 mm (2.95 in) used the same mounting as the 6 pounder and the crew and internal management of the turret remained essentially unchanged. There was already a large supply of ammo of this caliber, both of American and French origin, in North Africa. In fact, with the introduction of Shermans in British service in North Africa at the end of 1942, a consensus was reached about the use of guns firing powerful HE shells against infantry. This was something that previous models armed with the 2-pounder couldn’t do, not even the so-called “CS” versions armed with a 95 mm (3.74 in) gun, mostly reserved for smoke rounds. Therefore, it was decided to standardize this caliber and, at the same time, the reliable and cheaper Sherman became the first tank in service by numbers and would remain so until the end of the war. This ROQF 75 mm (2.95 in) gun, though able to fire a useful HE shell, was not as effective against armor as the 6-pounder or the Ordnance QF 17 pounder gun. In addition, a 2 inch (51 mm) “bomb thrower” angled to fire forward was fitted into the turret top, with thirty smoke grenades carried. A second bulkhead separated the fighting compartment from the engine and transmission compartment. The cooling system drew air in through the top of each side and the roof. Hot gasses were exhausted to the rear louvers. Fording preparation (up to 4 ft/1.2 m deep) imposed the move of a flap to cover the lowermost air outlet. Another air flow to the engine sucked air from the fighting compartment or the exterior, through oil bath cleaners. The Meteor engine, in its first version, developed 540 hp at 2,250 maximum rpm, limited by a governor built into the magnetos to avoid reaching speeds that the suspensions could no longer manage without damage. It was shown indeed that the pilot tanks could easily reach 75 km/h (47 mph), something unheard of for a British tank, but the Christie suspension (later reinforced by adding more tension) simply could not cope with these speeds. It was therefore decided to govern the engine maximum RPM and, thus, the top speed. But the torque was there, available both for mobility and traction. The gearbox had five forward and one reverse gears. Fuel consumption (on “pool” 67 octane petrol) per gallon ranged from 0.5 (off-road) to 1.5 miles (road) for a total 110 gallons of internal capacity. Off-road speed was 65 km/h (40 mph) with 3.7:1 final reduction drive and around 25 mph (40 km/h) off-road. Later on, armor was added and the engine was re-rated to 600 hp to cope with the additional weight. To face muddy terrain or snow encountered in Northern Europe, later versions were given 14 in wide (36 cm) or even 15.5 in wide (40 cm) tracks. In all cases, ground clearance was 16 inches (40.6 cm). Several British firms besides Leyland contributed to the production of the Cromwell and Centaur, including LMS Railway, Morris Motors, Metro-Cammell, Birmingham Railway Carriage and Wagon Company and English Electric. In all, 3066 A27M Cromwell were built, but when adding the A27L (950), the entire A27 class was 4016 tanks strong. 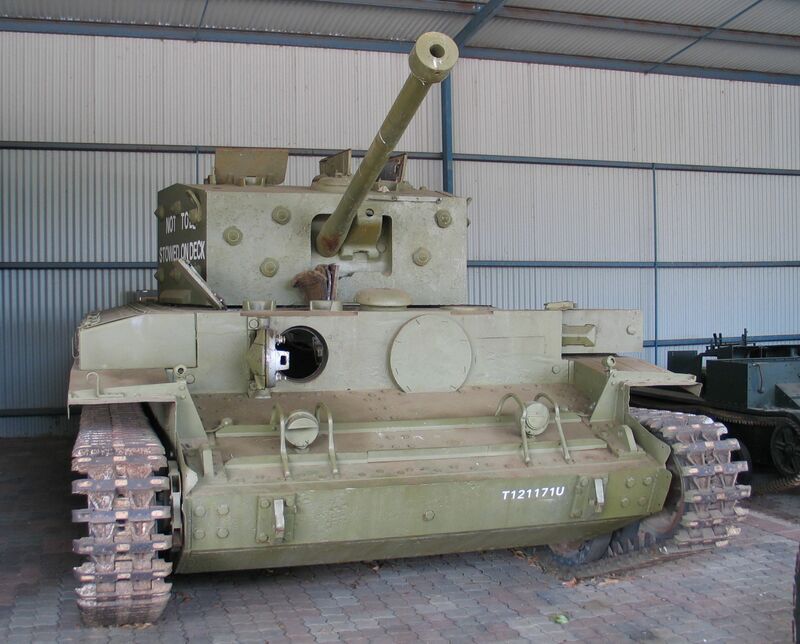 This was still way below the total of Shermans used by the British Army and the Commonwealth and, for the sake of standardization, first line regular units were preferably equipped with the Sherman, while the Cromwell was mostly used for special (elite) units and more specific purposes. A virtual duplicate of the Centaur I with the early V12 Meteor engine and 6 pdr (57 mm/2.24 in) gun. Only 357 were produced. This prototype had increased track width and the hull machine gun was removed to increase storage. Centaur Is upgraded with the early Meteor V12 engine. Only 200 were so converted. The first major production version, it also comprised Centaur Is and IIIs upgraded with the latest Meteor engine. Over 1,935 units were produced with several hulls types and the new 6-pdr re-chambered as a 75 mm (2.95 in) gun. 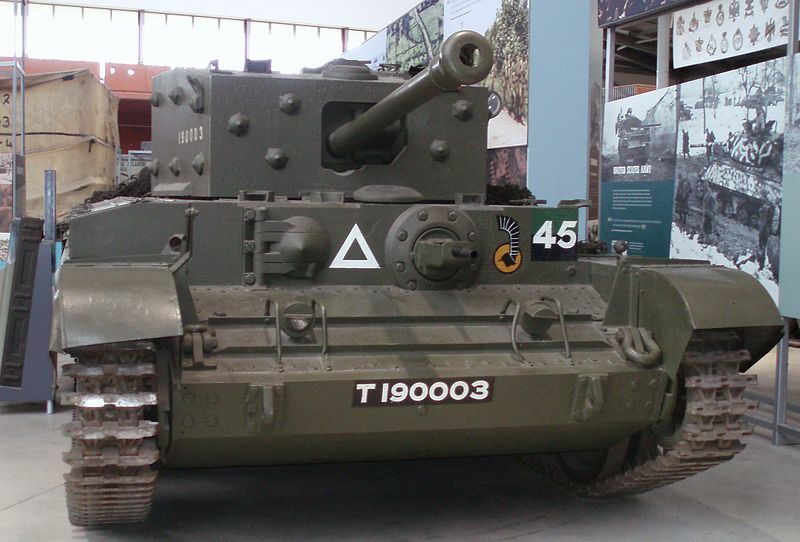 By far, it was the most common version of the Cromwell. A version upgraded with the new Meteor engine, and all welded hull (“w” stands for welded). A production version using, from the start, a welded construction and 75 mm (2.95 in) gun. Specialized CS (Close Support) version armed with 95 mm (3.74 in) howitzer and carrying with smoke and HE rounds. Only 341 were produced. 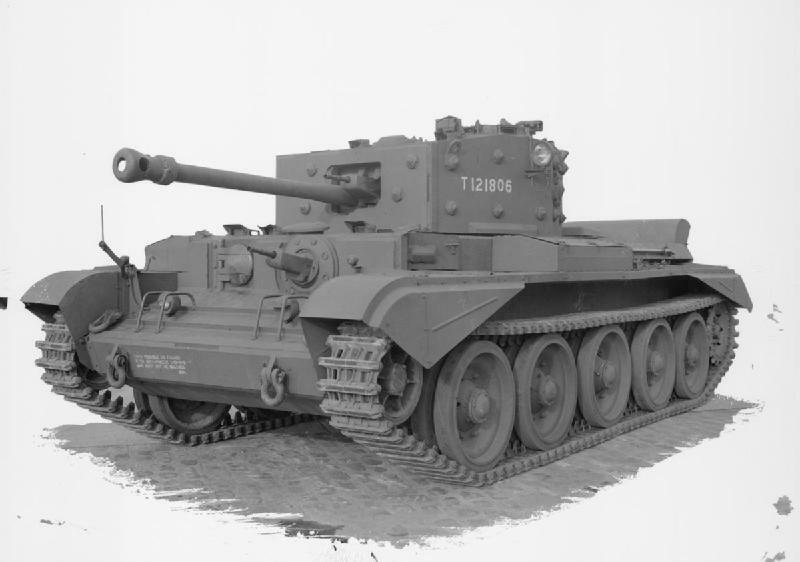 These were upgraded Cromwell IV/Vs with additional armor (100 mm/3.94 in front flat plate), fitted with the wider 15.5 inch (40 cm) tracks and and some gearbox changes. Around 1,500 were so upgraded and produced relatively late in the war. Cromwell Vw upgraded to the Cromwell VII standard or built as such from the start. Cromwell VI upgraded to the standard of the Mark VII. 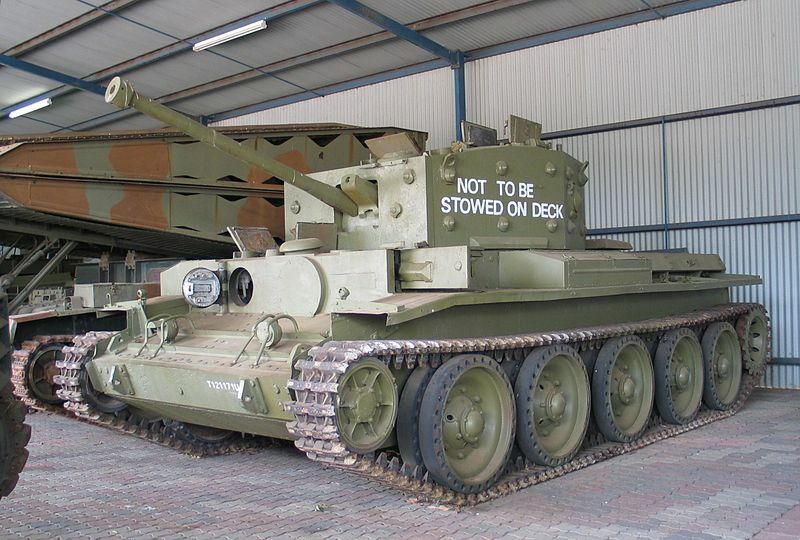 The Cromwell and Centaurs were nearly impossible to tell apart visually. Only the identification plates, cross-linked to the specific factory delivery lists can give a clue, since some manufacturers built the A27(L) rather than the A27(M). Centaurs, more often than not, had the raised vent on the engine deck. However, English Electric, that produced the “vented Centaur”, received an order for around 1200 Centaurs, but swapped from the Liberty to the Meteor engines after 130 units, these being Cromwells. However, these vehicles were still essentially built like Centaurs, with weaker suspension springs and proper internal track adjustment features. To add some more confusion, production hulls varied over time and factory adjustments. Type A hull: Both the driver and hull gunner had lift-up hatches. Type B and C hulls mostly had a slightly different internal arrangement. Type D/E hulls: Reworked engine deck panel arrangement. Type F hull: Swing-out hatches for the hull crewmen, extra stowage bins on the turret sides, fender bin on the driver’s side removed. Welded hulls (around 100+ built): Applique armor on the front hull and turret sides, “Vauxhall” driver’s hatch. The main gun was removed and two N°19 (High & Low Power) wireless sets were carried. Used by brigade and divisional headquarters. Cromwell IV, Cromwell VI or Cromwell VIII keeping their main gun but fitted with extra radio equipment (2 x No. 19 and 2 x No. 38 portable radios). These were fitted with two No. 19 Low Power radios and kept their main gun. Used by regimental headquarters. 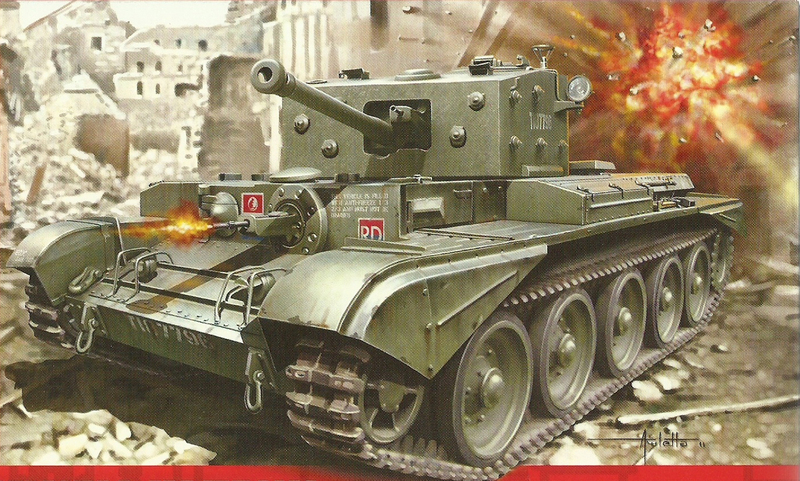 An experimental design intended to replace the Churchill infantry tank. The Charioteer was a postwar derivative fitted with a new turret housing the QF 20 pounder (84 m/3.3 in) gun. The A27Ms were already available in the beginning of 1944, but none left the British soil. They were all kept for training, and the series was refined until D-Day. 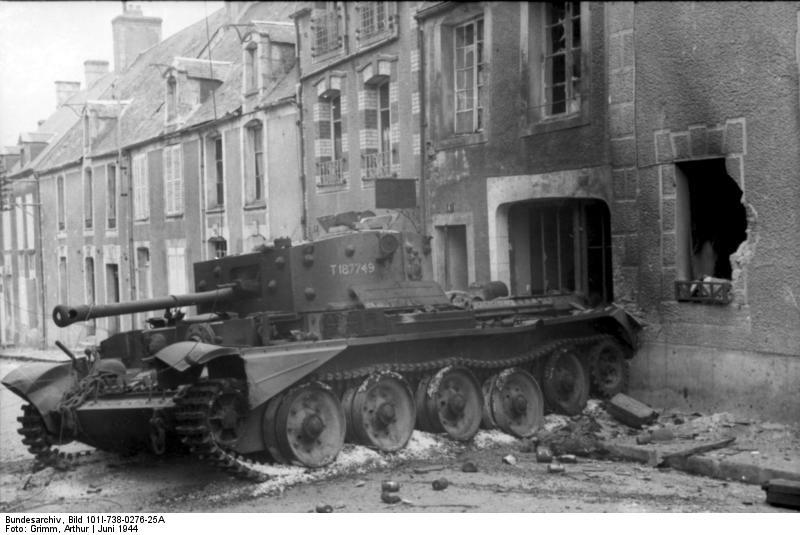 Since Shermans formed the bulk of British and Commonwealth armored units, Cromwells were used only in the armored brigades of the 7th Armoured Division, as well as the armored reconnaissance regiments of the elite Guards Armoured Division and the 11th Armoured Division, which all served in North-western Europe. In June 1944, the Cromwell saw action for the first time, during Operation Overlord, the Allied invasion of Normandy. 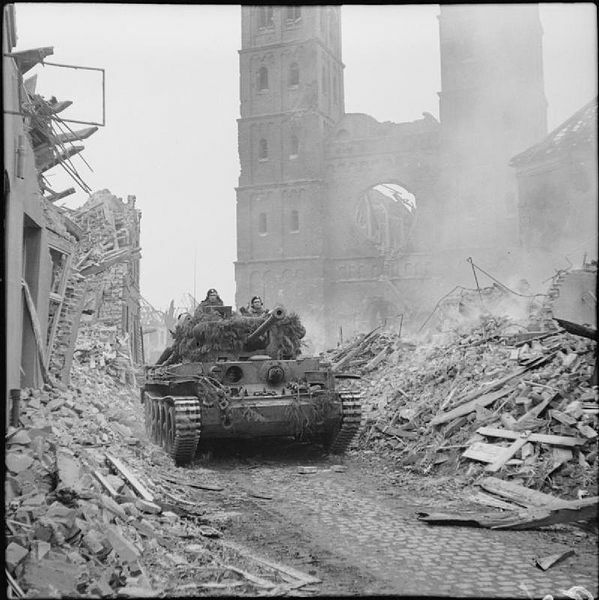 The Normandy campaign, however, especially at the beginning and until the Falaise pocket battles, showed the Cromwell struggling with the narrow lanes and hedgerows of the Normandy countryside. Hedgerow-cutters were hastily welded to the beak of some tanks, but losses were generally high. At Villers Bocage, on June 13, 1944, an entire column was ambushed and wiped out by a few Tigers commanded by Michael Wittmann of the 101st SS Heavy Panzer Battalion. Most of the 27 tanks, lost in less than 15 minutes, were Cromwells. However, after August, the terrain once more favored mobility and speed, and the Cromwell showed all its qualities, despite a much less resolute opposition. The Cromwell was also used by Allied units of the 1st Polish Armoured Division (10th Mounted Rifle Regiment) and 1st Czechoslovak Armoured Brigade, which soldiered in the Netherlands and Germany until V-day in May 1945. Their career did not end in May 1945. Some saw service in the Korean War with the 7th RTR and the 8th King’s Royal Irish Hussars. Modified Charioteers saw extensive service until the 1960s in Great Britain and much later in other countries like Finland, Austria, Jordan and Lebanon. 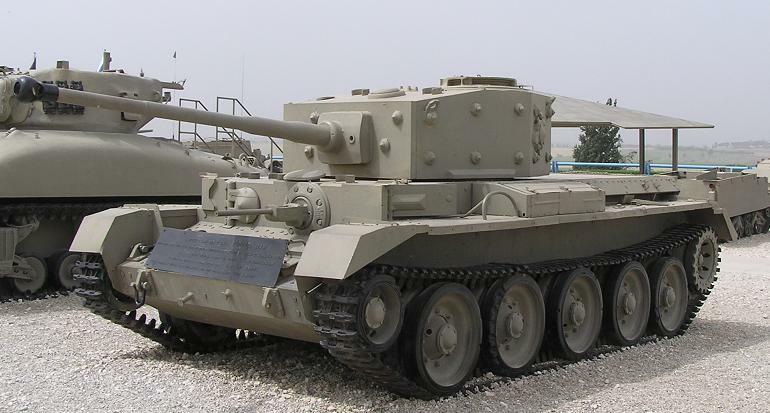 The A27M was also used by the IDF in the War of Independence (1948–1949). Others were purchased by the Portuguese Army and maintained in service until the 1960s. Reception of the new tank by the crews was mixed. Being must faster than the Sherman and favored by a lower profile, they also had a thicker frontal armor plate and a good gun. But, at the same time, it was soon discovered that neither the armor nor the firepower was a match for the Tiger and Panther that were already one step further. 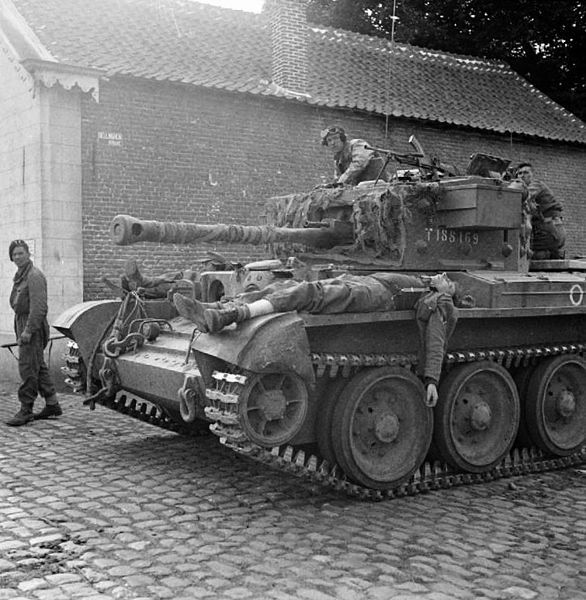 Like the Shermans, the Cromwell needed to maneuver in order to get a better angle, which was even easier because of their excellent mobility. The Rolls Royce was a wonderfully engineered piece of machinery but needed much more maintenance than the Sherman engines. Reliability was a discovery for British crews, accustomed to previous generations of Cruisers equipped with the Liberty engine. This resulted in a far greater rate of availability for any given operation. The next step was to install a 17-pdr (76.2 mm/3 in), the only gun that could take on any German tank at the time. But the turret of the Cromwell was never tailored for it, and a small number of Challenger and Firefly tanks were provided instead. 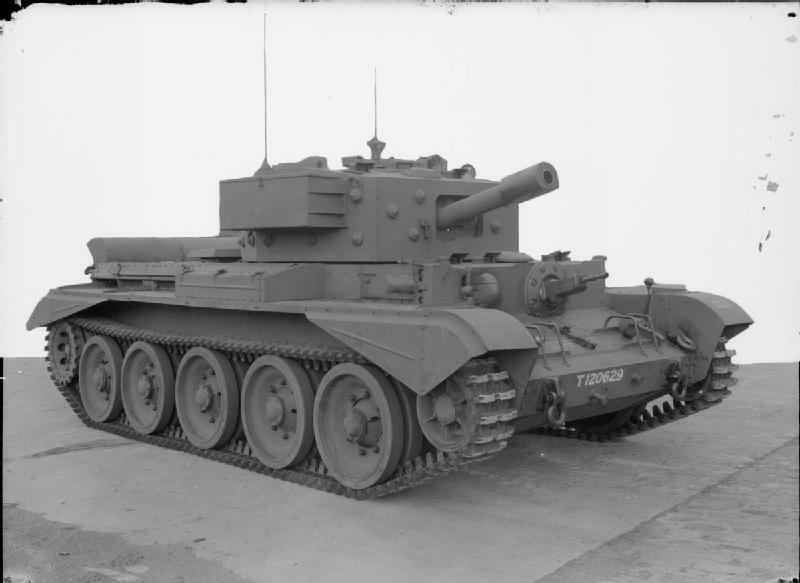 By the end of 1944, British engineers upgraded the Cromwell, which was at last given a new turret able to house the 17 pdr. But it was too little too late and the Comet did not change the face of events. The Comet would eventually lead to the Centurion in 1945, the world’s first MBT and one of the most successful tanks ever designed. At least seven Cromwells are on display throughout the world today. A Centaur Mk.III, for comparison. 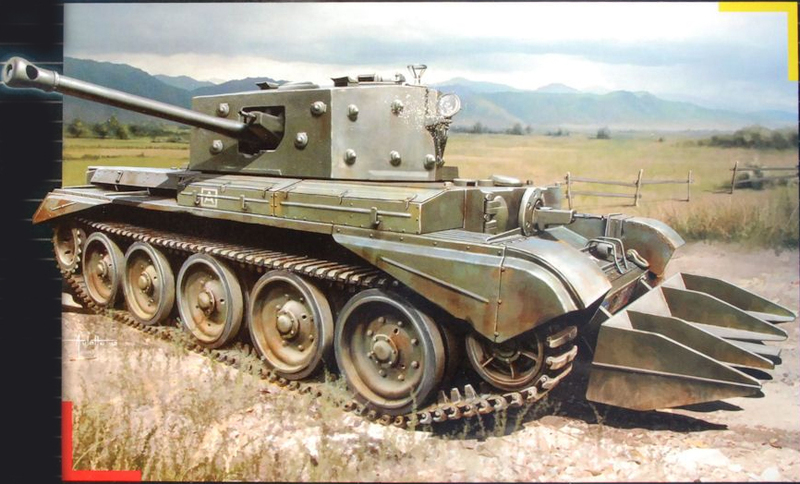 Cromwell Mark I, early 1944, Great Britain. This version was only kept for training, being equipped with the early V12 Meteor and 6-pdr gun. The Cromwell Mk.III was essentially a re-engineered Centaur with a Rolls-Royce Meteor engine. Here is one from Normandy, 1944. 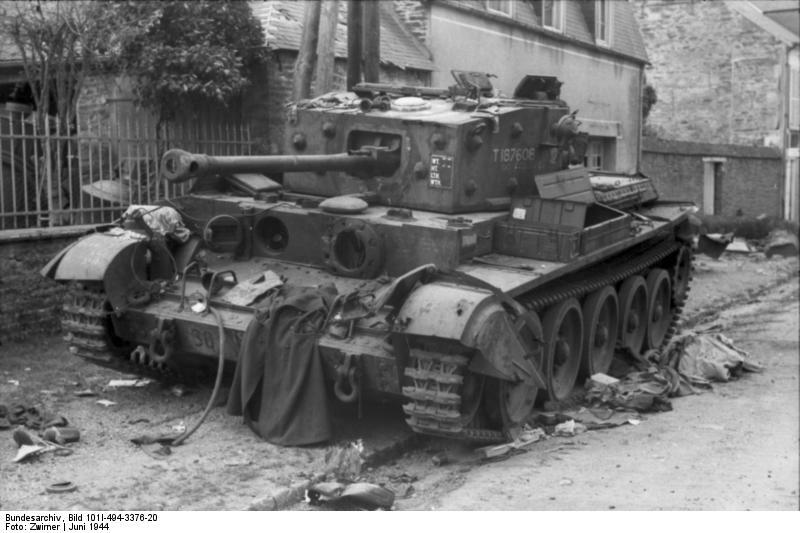 Cromwell Mk.IV, unknown unit, Normandy, summer 1944. Cromwell Mk.IV, Type F hull, 1st Regiment, Czech Independent Armoured Brigade Group, Dunkirk, May 1945. Cromwell Mark IV, 1st Royal Tank Regiment, 7th Armoured Division, Germany, May 1945. Cromwell Mark IV, 13th Mounted Rifle Regiment, 5th Polish Division, Normandy, August 1944. Cromwell Mark IV with hull Type F, 1st RTR, 7th Armoured Division, Germany, 1945. 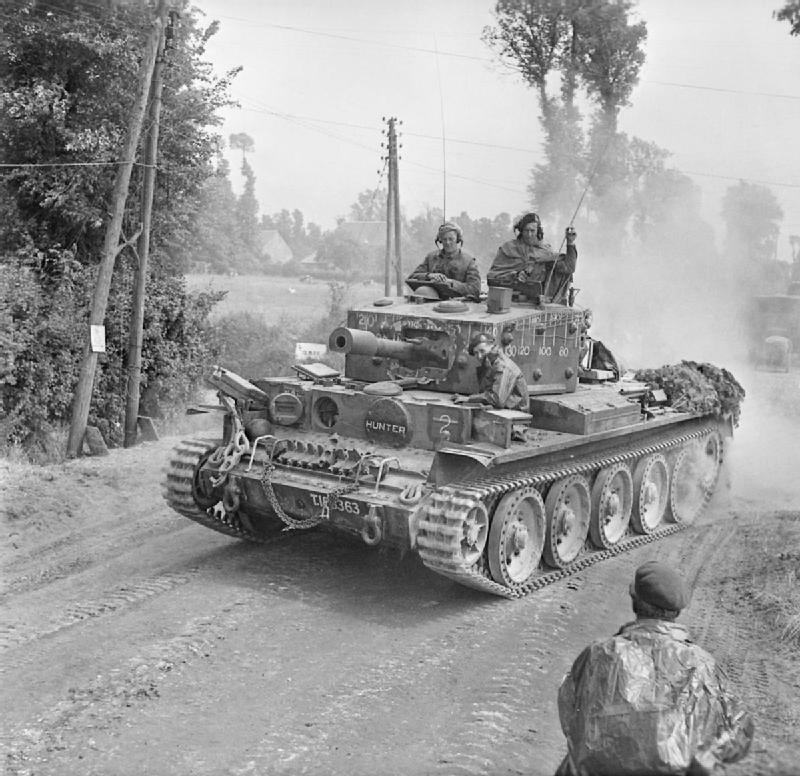 Cromwell Mk.IV “Agamemnon” with rubber stripes, 3rd Northamptonshire Yeomanry, 11th Armoured Division, Normandy, 1944. 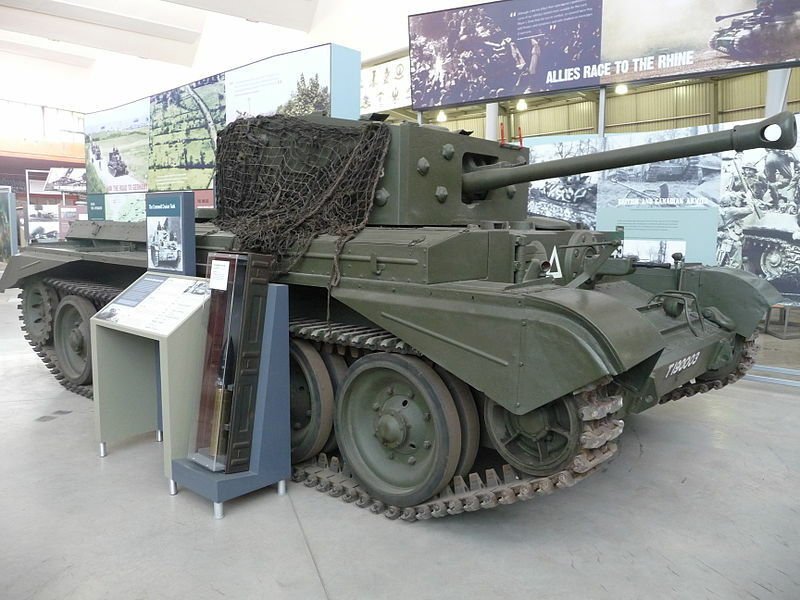 Cromwell Mark V CS. This model was up-armored, with an add-on welded plate raising the front to 101-102 mm (3.98 in). Polish Cromwell Mark VI, 3rd Squadron, 10th Mounted Rifle Regiment, France, August 1944. Cromwell Mark VII of the 7th Armoured Division, the “Desert Rats”, Korea, October 1950. The A30 Cruiser Mark VIII Challenger (1943) was a derivative of the Cromwell, and the only one fitted with the massive 17-pdr (3 in/76.2 mm) gun. Here is a tank from the Czechoslovak Independent Brigade, 1st Armoured Battalion, Prague, May 1945. 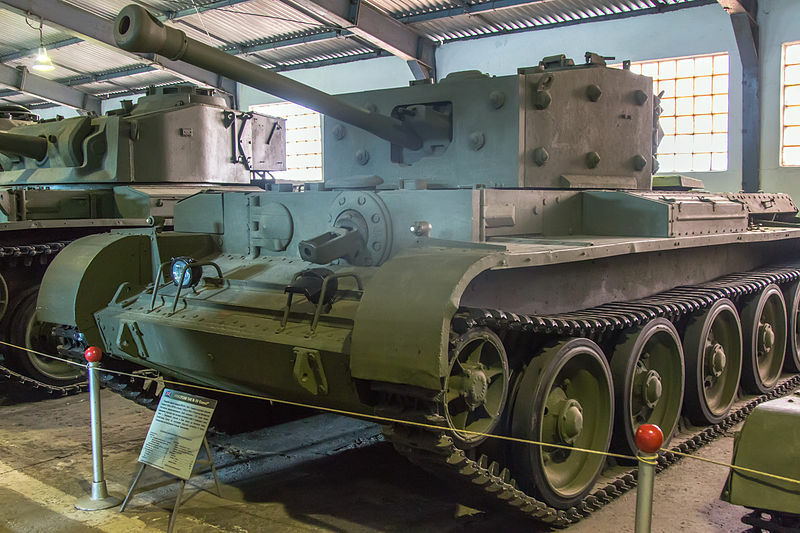 The FV4101 Charioteer (1950) was a Cold War recycling of the hull, fitted with a new turret housing the 20-pdr (84 mm/3.3 inch) gun, first intended for the Army Reserve Territorial units. Around 400 were built and also exported, seeing service until the late 1980s in Lebanon. 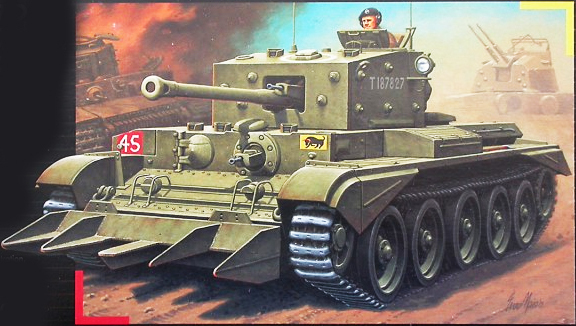 Artist impression of a Cromwell, boxart, Airfix. A Welsh Guards A27M in a speed display at Pickering, Yorkshire, March 1944. 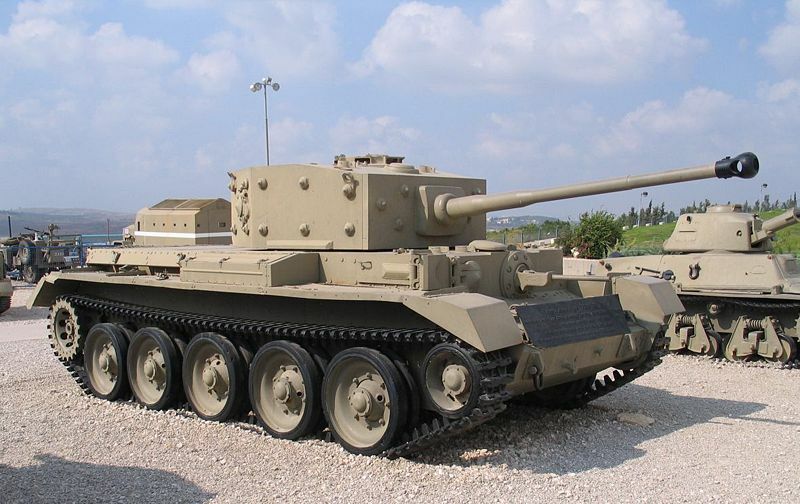 A Cromwell Mark VI, the close support version equipped with a 95 mm (3.74 in) howitzer. 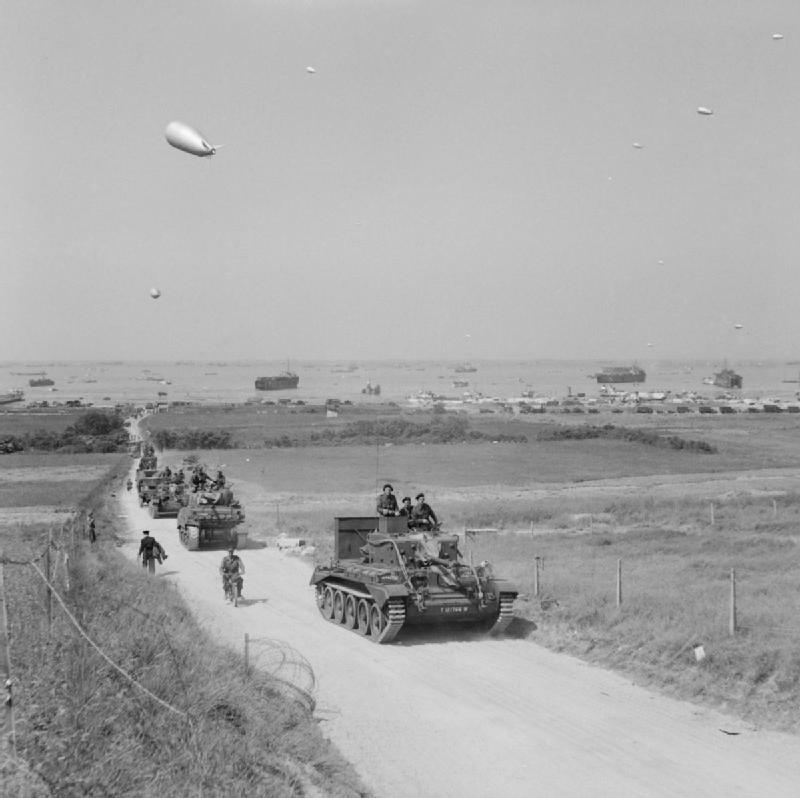 The vehicles of ‘B’ Squadron, 15th/19th King’s Royal Hussars, included two close support Cromwells with 95 mm howitzers (in foreground). Behind them can be seen a regular Cromwell armed with a 75 mm cannon. The photograph was taken in the low ground between the Dortmund-Ems Canal and the Teutobergerwald. 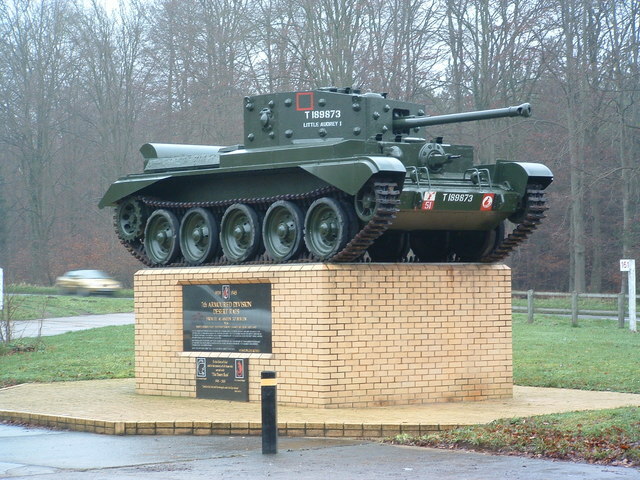 Cromwell VIIw, the welded hull variant. There is a mistake in the unit name of the 7th coloured Cromwell above. “13th Mounted Rifle Regiment, 5th Polish Division” – there were no such unit or Division. This was 10th Mounted Rifle Regiment from 1st Polish Armoured Division, the only one Polish unit that was using Cromwells in fight (oh, well – the commander of 3rd Polish Infantry Brigade from the same 1st Armoured Division used also one Cromwell, but this was only because he was a commander of 10th MRR before… 🙂 ). 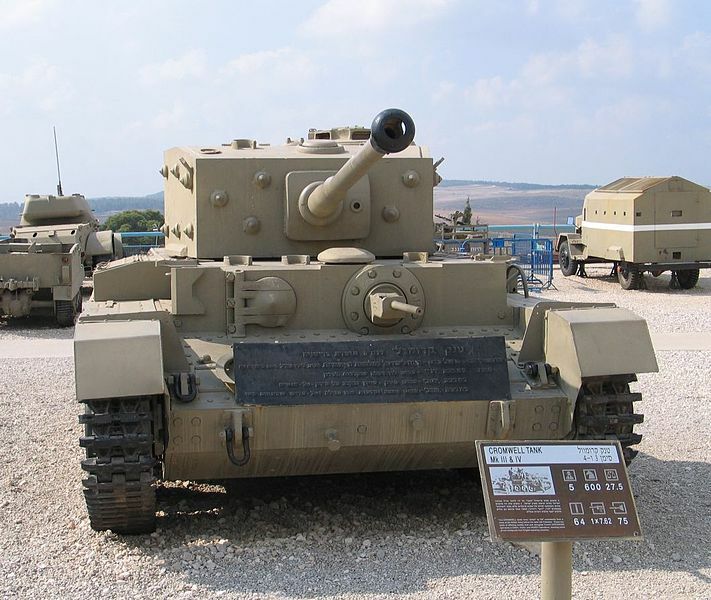 Is there any more info on that israeli cromwell in the gallery? Like why the main gun looks longer and it has a different mantlet. Is it a dummy gun? Is it confirmed that the Cromwell VII had the add on armour? And it saw service in WWII ? when you say ‘The RR Meteor was an in-line V12 water-cooled gasoline engine ‘, is this is a mistake? I thought in-line and V12 were different engine configurations. 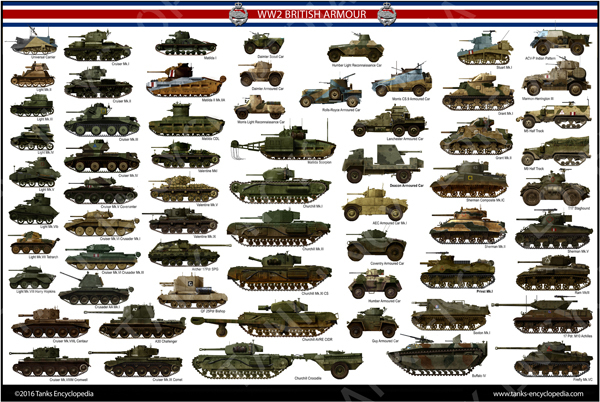 At the very top of the page, where the number of tanks built is displayed, the word “built” is spelt “builte”. Can anyone point me to drawings for the Cromwell, i am looking to build one. Other than scaling a 1:36 model up it would be better to work from a drawing. I normally make locomotives and i would like to do something different.